In a community with as many resources as Champaign-Urbana, why does gun violence persist? 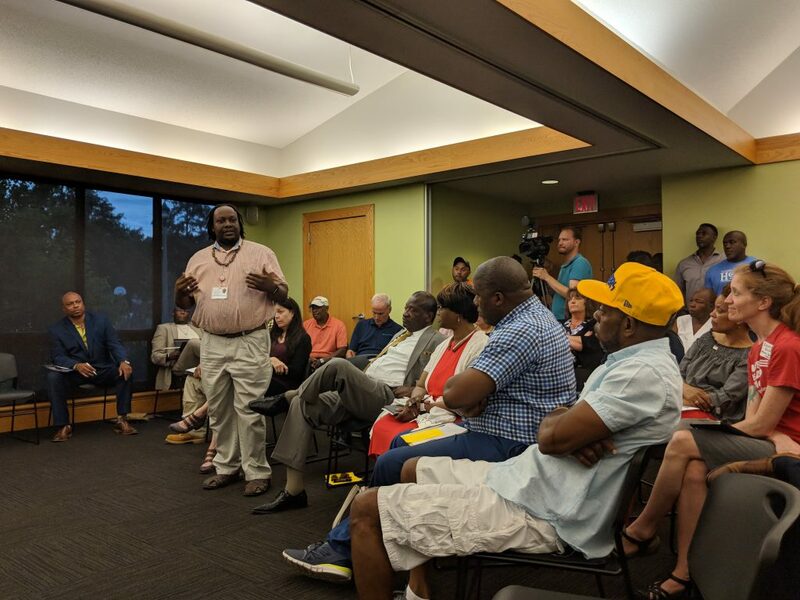 That’s the question Donte’ Lotts, a community liaison for CU Fresh Start — an initiative created in 2015 to mitigate gun violence — asked a group of about 50 Champaign-Urbana residents, social service providers, university employees and other community leaders on Thursday night. The group gathered at the Douglass branch of the Champaign Public Library for a special meeting of the Champaign Community Coalition. It was an opportunity, said Tracy Parsons – the coalition’s facilitator – to brainstorm why the number of shootings continues to increase, and what the community can do to curb the violence. So far this year, there have been more than 50 shooting incidents in Champaign-Urbana, compared to only 35 at the same time last year, according to a news release from the city of Champaign. 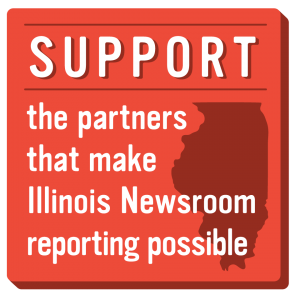 Within the last several weeks, there’s been roughly 20 shootings across Champaign-Urbana, Decatur, Danville, Springfield, Bloomington and Peoria, Parsons said. “All our communities are on fire,” he added. Despite a stated commitment to the issue over the last several years, Champaign-Urbana, like other Illinois communities, has struggled to curb its gun violence. The CU Fresh Start program is based on a national anti-violence model known as “Don’t Shoot.” Peoria launched “Don’t Shoot” in 2012 and Springfield officials recently launched a similar program in that community. Human Relations Officer for Urbana, Vacellia Clark, facilitated a wide-ranging discussion that offered attendees the chance to express their deepest concerns about the violence, the community’s strengths and what actions should be taken to address the violence. Among the top concerns raised at the meeting: gang activity, the availability of firearms, normalizing violence and the potential influence of violence in video games, a lack of parenting, or the fact that many parents grew up without role models themselves, the increasing violence and pervasive, systemic poverty coupled with government inaction. These concerns are not new. But what makes Champaign-Urbana unique, Parsons and others argued, is the commitment of its leaders to address the issue of gun violence and the resources at their disposal to tackle it. CU Fresh Start, the several dozen African-American churches clustered on the city’s north side, the U of I, and First Followers — a re-entry program for the formerly incarcerated — came top of mind when the group was asked to name its greatest strengths. But some of those same strengths doubled as weaknesses. “To have 36 African-American churches on this side of town and have this kind of issue is a problem. … It should be a strength, but that’s a problem and it needs to be dealt with or we need to have a conversation about that,” said Rev. Willie Comer, pastor of Berean Covenant Church and executive director of East Central Illinois Youth for Christ. Other attendees said the U of I was like an island within the community, separate and aloof from its issues, including its gun violence. The university system, they said, had not brought its considerable resources to bear on the problem. Another resident said that the city of Champaign is divided between south and north — with fewer amenities available to youth and families who live on its northside, and little concern for their problems by those who live on the south side of town. So, what can a group of motivated individuals do to solve a seemingly intractable problem? Perhaps start by placing an emphasis on the impact of the violence, said Mary Brown-Smith, mother of Rashidi Overstreet, a 40-year-old man who was shot and killed in Champaign in 2014. “I don’t think they know how the parent feels when they lose a loved one… how I feel everyday. You never lose the feeling of losing a loved one,” she said. What he learned in the process, he said, was that “a lot of these young men have never been hugged before.” It’s hard to show a child love if you’ve never experienced it yourself, Williams said. That sentiment was echoed by Minnie Pearson, president of the Champaign County NAACP. “Parents need mentors, too. They honestly don’t know how to be parents. They’ve gone through their own trauma… and it takes the community to wrap around some type of program,” she said. “We don’t have a clear picture of where our needs are,” she said. That theme — working in silos, a lack of coordination, the struggle for the same limited resources — surfaced as a deep concern and as a primary issue to tackle. Lotts said if the work that’s being done continues in isolation and without consultation with the rest of the community’s efforts, the problem will persist. Parsons said that convening this group of dedicated community members was in part a way to bridge the divides between them and spark a reinvigorated, collaborative effort to curb the shootings. He urged the group to sign up for committees, to look for grants, to drop notes into a suggestion box and to keep working together in spite of their shared frustration. Previous post: What’s Being Done To Stop The Spread of Hepatitis A In Indiana?